Blood pressure describes the pressure in the main blood vessel in your arm, which stems from the heart. Blood pressure is measured both when the heart is actually beating (systolic pressure – the first measurement) and between beats (the resting rate, or diastolic pressure – the second measurement). It is given as two figures, eg 120/80. A device called a sphygmomanometer is used. An inflatable cuff is wrapped around your upper arm. When inflated the cuff stops the blood flow in the main blood vessel in your arm. The nurse then watches a gauge in the sphygmomanometer and listens through a stethoscope as the air in the cuff is released. When the first sound of the heartbeat is heard, the systolic pressure is recorded. When the sound disappears, the diastolic pressure is recorded. Sometimes a computerised blood pressure machine is used to take the readings automatically. Blood pressure is an indicator of general health. A rise in blood pressure means your heart is overworking. This can put a strain on your circulatory system. On the other hand a fall can affect your organs (eg kidneys). So it is important your blood pressure is kept within the normal limits. A healthy blood pressure is in the range 90/50 to 120/80. Blood pressure varies throughout the day and your levels of physical exertion and stress cause it to change, too. So blood pressure should be checked under resting conditions. Single measurements aren’t particularly meaningful. A diagnosis of high blood pressure (hypertension) isn’t normally made unless a high reading is measured on three separate occasions – usually over three months. High blood pressure increases your risk of dangerous health problems, such as heart attacks and strokes – the higher the pressure the greater the risk. Around one in three men and women in the UK have high blood pressure. Blood pressure rises as we get older but some people defy this seemingly inevitable development. Regular exercise, maintaining a healthy weight, a low fat (especially saturated animal fat) and low salt diet, quitting smoking and reducing the amount of alcohol consumed will all have an effect. Even allowing for all that, the blood pressure of vegetarians doesn’t increase in the same way as meat eaters’ – in fact, it goes up little with age. It’s not surprising, then, that a vegetarian diet can be used to treat high blood pressure. It is the totality of the vegetarian diet that works, not any specific ingredient. Vegetarians’ lower risk of high blood pressure is considerable and can be anywhere between 33-50 per cent. There is an inescapable link with meat and a Californian study as long ago as 1926 showed this. Vegetarians’ blood pressure was raised by 10 per cent simply by feeding them meat – and it happened in only two weeks. Other studies have produced similar results and a whole range of studies have shown vegetarians to have considerably lower blood pressure than meat eaters. It is also the finding of the World Health Organisation and American Dietetic Association. Not surprisingly, many studies have found that changing to a low-fat vegetarian diet can significantly lower blood pressure. The switch can also reduce the distressing symptoms associated with hypertension, according to a Swedish study. At the end of the trial period, most patients had been able to give up medication, 50 per cent felt ‘much better’, 15 per cent felt ‘better’ and 30 per cent felt ‘completely recovered’. 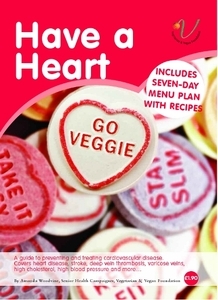 For more information see our Have a Heart guide.